Serious fun, camaraderie, and sailing is what the International Yacht Paint Gozo Regatta, organised by the Royal Malta Yacht Club, was all about. A popular event after the long winter haulage, the International Yacht Paint Gozo Regatta kicked off on a Friday afternoon with boats in the IRC Racing category taking part in two windward /leeward races in a good north westerly breeze while the IRC cruisers sailed from the start in Sliema to the Ghallis Cardinal mark and back to finish in Sliema. On Saturday racing consisted of two coastal races. The first race started from 1nm off Sliema coast with a short windward leg to Tigne point and finishing in Mellieha. The second race of the day started in Mellieha and saw boats racing around Comino and finishing in Gozo. The breeze held right through the day providing boats with some excellent racing conditions. On Sunday two coastal races were held. The first race took place around a large triangular course set between Gozo and Malta. The second race was a passage race from Mgarr and finishing at Ghallis, rather than at the Yacht Club in Marsamxett due to a declining wind forecast. "The light and fluky wind conditions provided for a very challenging weekend, especially on Sunday, with the second race of the day being particularly challenging. Nevertheless we performed well and would like to thank the sponsors and organisers for a great event". Said Matthew Farrugia, racing on Lightning winner of IRC racer class 2.
International Yacht Paint through its long standing distributors, Mac Med Limited, have returned to sponsor this spring's edition of the Gozo Regatta Weekend organised by the Royal Malta Yacht Club. 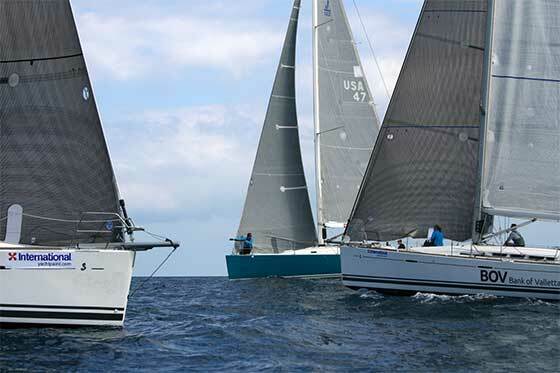 On the sponsorship, Mac Med's Andrew Magri Overend said, "We are thrilled that International Yacht Paint have decided to sponsor this event and are sure that the programme that has been devised will provide an exciting opportunity for all participants. It is a pleasure to be working again with the team at the Royal Malta Yacht Club via our sponsorship of this event since we are keen to see as many young people as possible take up the sport of sailing. This collaboration again reflects International Yacht Paint's commitment to the sport whilst it continues to consolidate its leading position as the premium Yacht paint brand that they are". Social events play a very important part in the sailing scene and the weekend social calendar kicked off with a wine and cheese Party held in the Club's terrace, saxophonist trio made up of Graham, Stephen and Michelle performed a wide variety of tunes setting the scene for what was a relaxed evening, where sailors exchanged notes on the day's race and friends absorbed the atmosphere. On Saturday crews were welcomed at the Mgarr pontoon with an ice cold beer, just before heading to the idyllic setting at Country Terrace in Mgarr, where crews congregated to enjoy the sunset and dine in the company of family and friends. The Royal Malta Yacht Club's next sailing commitment, which will also be supported by International Yacht Paint, will be the first international offshore race of the 2015 Racing Calendar. The International Yacht Paint Marzamemi Regatta will be held on the weekend of the 1st of May and to date over forty yachts have already registered for this ever popular Regatta. More information on forthcoming events at the Royal Malta Yacht Club can be found on www.rmyc.org .